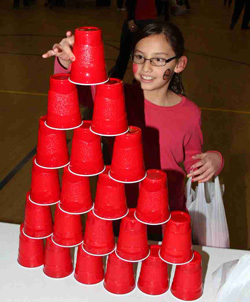 Cup stacking is one of the most popular games at the Sobriety Carnival! Greetings friends! I hope you are all doing well, staying healthy, and staying warm. Things here at St. Joseph’s Indian School are going well. We have a busy week ahead of us! This weekend is our annual Valentine’s Day Sobriety Carnival and Dance. This celebration helps to promote sobriety while the Lakota students in grades 1-5 grade enjoy carnival games and the students in grades 6-12 get to have a dance. Our Substance Abuse Prevention Committee (SAPC) puts on several activities throughout the year to promote sobriety and the dangers of using drugs and overusing alcohol. The students always seem to enjoy these celebrations. 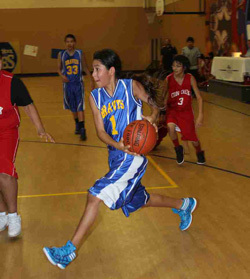 This weekend the St. Joseph’s Indian School seventh and eighth grade boys will host a basketball tournament. Several teams will be on campus to play in the tournament. The boys are very excited to play and hope to have many fans in the stand cheering them on. The seventh and eighth grade boys’ basketball team will host a tournament at St. Joseph’s this Saturday. Next week will bring the start of the Spring Cycle of the FAST program. Families and Schools Together, or FAST, is a great program that brings several of our families to campus for eight Fridays. The program consists of activities designed to help promote family togetherness and strengthen family bonds. We are looking forward to sharing the eight Fridays of FAST with 15 families this cycle! As always, we thank you for the support you offer to St. Joseph’s Indian School. Without your prayers and financial generosity, we would not be able to offer the programs so vital to our students here at St. Joseph’s Indian School. Previous Previous post: Home Safely! Next Next post: Visit us for a tour!